The new Creed sequel may be a movie about boxing, but it could also very well be an advertisement for your local gym. Michael. B Jordan’s Adonis Creed is back in the follow-up to Ryan Coogler’s 2015 Rocky spinoff – and no, this movie, sadly, isn’t written or directed by Coogler. In Creed II, Adonis is preparing to face a new opponent in the ring, while also confronting his past and questions about family and legacy. That all sounds fine and well, but most importantly, Jordan is jacked as hell in the sequel, and MGM and Warner Bros. are using his muscular physique to their full marketing advantage. First off, wow. Second, damn. Third, you’re telling me this movie opens on Thanksgiving?? A time of year many of us will spend stuffing our faces with more food than our bodies can contain before collapsing onto the couch for hours of bloated fatigue, resting up so we can drag our butts to the movie theater (not the gym) to watch Michael B. look like a chiseled machine? 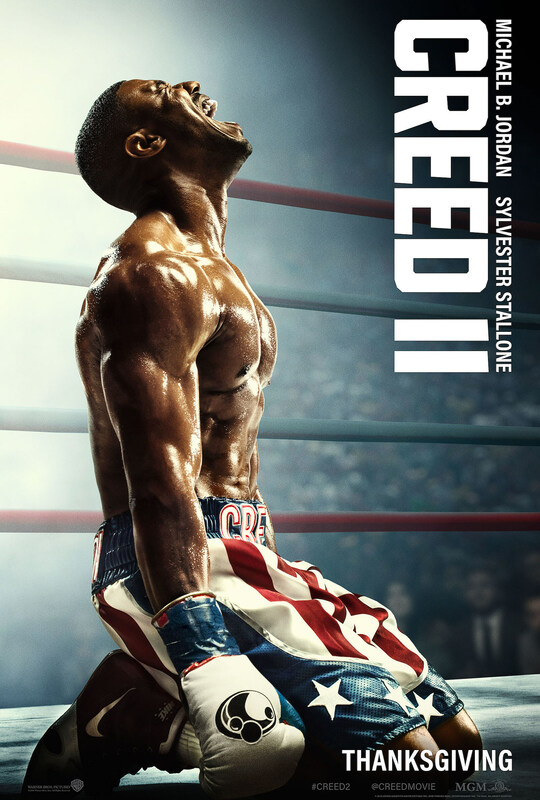 This poster both makes me want to sign up for a boxing class ASAP and see Creed II, so nice work guys! Or maybe that release date has more meaning. Perhaps Creed II is actually meditation on what it feels like at Thanksgiving when someone takes the last dinner roll. Jordan’s agonized scream accurately captures the experience of reaching for the green bean casserole for seconds, only to discover the dish has been, upsettingly, scraped clean. The new trailer for the Rocky spinoff, which is directed by Steven Caple Jr. and of course features the return of Sylvester Stallone and Tessa Thompson, arrives tomorrow. You already know when Creed II hits theaters.